Government of Punjab has ordered to issue Security Featured Passport Type Registration Books of Vehicles in all over Punjab. From July 1,2012 and onward Punjab Excise & Taxation department will issue this security featured Passport for you vehicles. Residents of Punjab having Cars, Bikes and other type of transport vehicles registered with Excise & Taxation department of Punjab can get these new type of registration books. Yes, you can also change or replace your aged, old and broken Registration Books and Certificates with this new one. For details observe the banner pasted below. 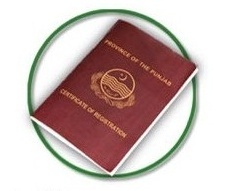 "Get Passport for your Car"
These new Registration Books are for all types of Transport Vehicles Registered in province of Punjab including Cars, Bikes, Vans, Hiace, Pickups and etc. How To: Visit you nearest office of Motor Vehicle Registration Authority and the office of Punjab Exercise and Taxation Department of Punjab in your city to get this Passport Registration Booklet. These latest type of Registration Plates and Registration Books helps reduce hassle, increase transparency and enable fast communication from central database.